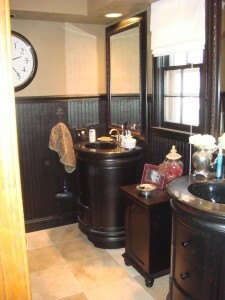 Welcome to Our Master Bathroom Story. (Yes, that is pink carpet in the bathroom). My husband and his brother put a lot of work into it and we just loved how it turned out. 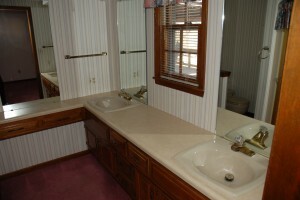 My two favorite items in the bathroom are the vanities. 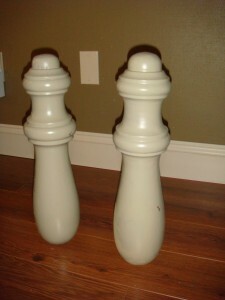 My husband and I bought these for ourselves at ZGallerie for our 5th wedding anniversary. So you might be wondering what the problem might be? 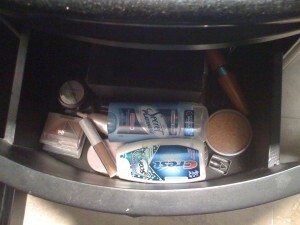 Now see, I don’t think I use that much makeup, (or do I? Now looking at it - it kinda looks like I do?) but anyways, what I do have, I want to be hidden and in some kind of organized fashion. 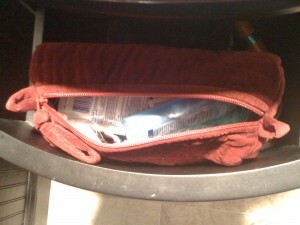 I have tried to put it in a cute little makeup bag - but I end up getting frustrated trying to find certain things. 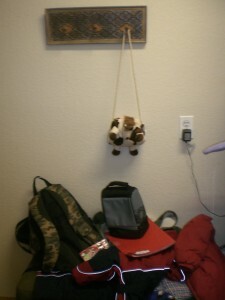 Then I tried to just let go and let them be free and that didn’t work well either. I know I can find some organizers but I’d like to not have to go searching - especially since the drawer is has an odd shape. And ideas?! If so — I have 2 more drawers that could use the same treatment!! 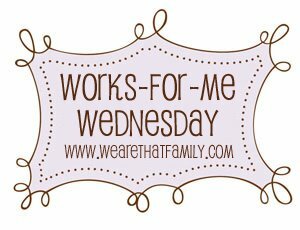 This week I’ve joined in again on Works for Me Wednesday @ We are THAT Family and this week is reversed so head on over and help out others like me! So if you read my post from yesterday — you saw my entry for The 5 Dollar Spring Challenge Party thrown by Living with Lindsay and hopefully you found some more fun and great ideas at her place. But it was actually Lindsay’s project that just stuck with me the whole entire day! I seriously thought about it all day long. 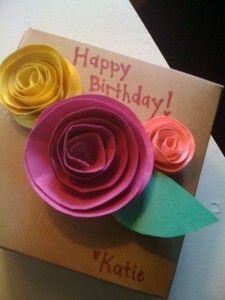 Yesterday was my sister-in-law’s birthday. Happy Birthday Mindy! Her gift came in a little brown box so I thought I would do what I do 99% of the time and that is put a ribbon around it — but after Lindsay’s idea — I was inspired to do something different. 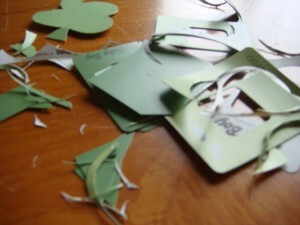 It was so easy and so fun to do! I started slow with just one rose and liked the simplicity but then I wrote my message and it just needed more - and the cluster just brought it to life! If you didn’t see Lindsay’s project - you have to see it! 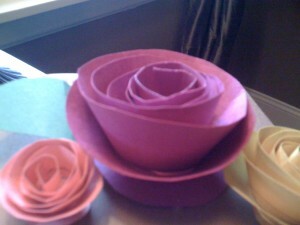 Click here and she even gives you a tutorial on how to exactly make the roses. Thanks again Lindsay for the reason why I blog…inspiration! I LOVED the idea of this challenge! 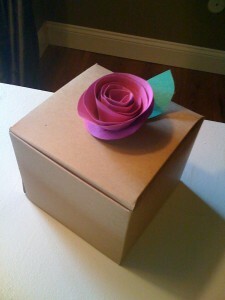 Goal: Spend five dollars or less, only at a dollar store and create a spring item! So for weeks I have been drooling over all of your fabulous wreaths made with eggs so I knew it could be done but I already had a wreath on the front door - so I didn’t know what to do?! 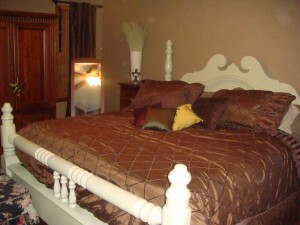 I loved the browns, creams, and black and the stripes - so whimsical but still neutral. Then I thought that the one thing I wanted this year was to have an Easter gift basket that can be used every year to put the boys’ gifts in. 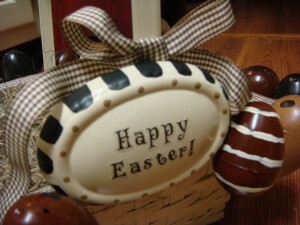 It could sit on my fireplace and on Easter morning we could fill it with gifts to celebrate the holiday! So with my new flying bunny in hand, we soared to the Dollar Store. Although I have already told Lindsay that I felt like I was on Top Design or Design Star and I even gave myself a time limit. (Well Chili’s really gave me the time limit because I was also picking up food to go). 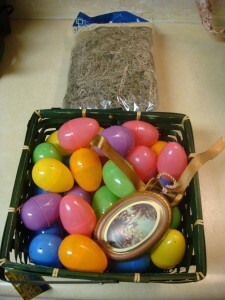 But anyways - I was like a mad woman on a mission - I knew I needed eggs, a basket, something to fill the basket with and something to write a “Happy Easter!” message. 15 minutes and I was done - and if you have ever shopped with me and know how much I second guess myself - this was GOOD! Here are my goodies all for under five dollars! Actually, for the record, $4.00 but I did get side tracked and found these cute memo pads that match my “To Do List” perfectly. Back to my Basket - Now my main supplies might have cost $4.00 but think this might have taken me close to 4 hours to complete! I spray painted, decorated, spray painted more, polyurathaned, hot glued, hot glued more and finally was complete! 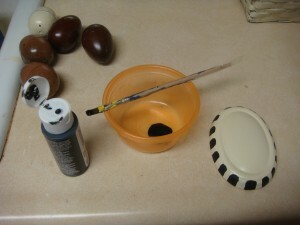 I then just used craft paints to decorate the eggs with stripes and polkadots. I also, by accident, realized that if you barely spray the spray paint little drops will come out and give that speckled look. Easy! I spray painted the ordament white and then added black stripes on it and later added brown polkadots in the gaps of the stripes. 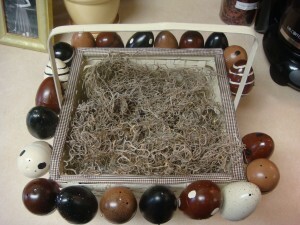 I filled it with moss, and lined the top of the basket with extra ribbon I had with, what else, hot glue. 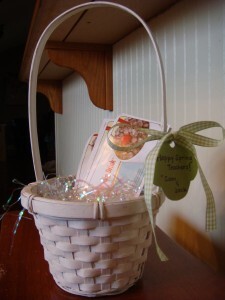 I used extra sticker letters I had to spell out, “Happy Easter!” on the plaque and then hot glued that too along with a bow of ribbon to the front of the basket. 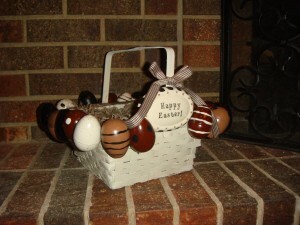 Seriously - $4.00 and more than 4 hours later it landed on my fireplace and awaits to be filled with Easter gifts. But, very well worth it! I am so glad I did it and I had SO MUCH FUN! Thanks again Lindsay for the fun challenge. I’m excited to see what everyone else came up with too! Head on over to Living with Lindsay’s 5 dollar Spring Challenge! I believe Martha was the one who started all this trouble. 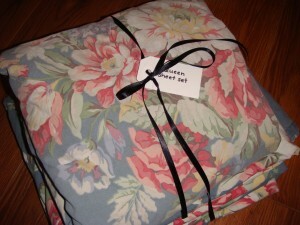 A couple months back I learned, from Martha Stewart, how to fold sheets, especially the fitted ones. 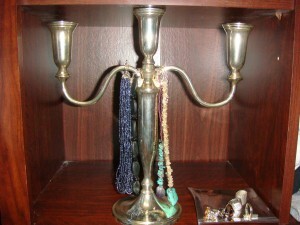 Once they were placed so nicely in my linen closet, I would go to grab one of them and all the others would get messed up! After all that work! So then my brilliant idea kicked in (thank goodness) and I used my trusty black ribbon and my tags to wrap them like a present and put them all in their own little spot. Now I LOVE getting new sheets out and not having to guess what they are (and better yet - my husband knows now where they are too) and I don’t mess up anything! Another option: I have a good friend that loved the idea but didn’t like the tying and untying so she found some stretchy elastic bands and then attached the tags on to it. Good thinking Andrea! 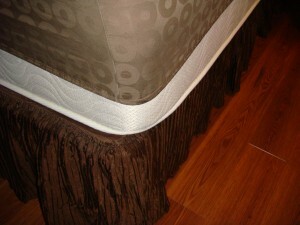 Is this happening to any of your beds?! Now I have a king size bed and this is a king size sheet - so what the heck?!!! 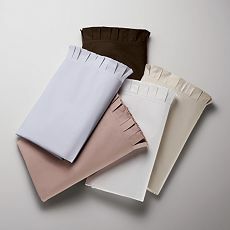 I was recently informed by my sister-in-law, that since I have a pillow top on my bed that I need deep fitting sheets. Oh bother!! 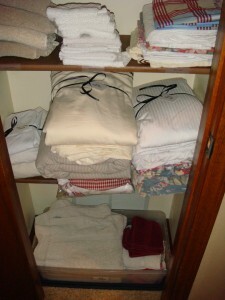 My linen closet and my new sheets, now, work for me, and if you hurry you can get some more great ideas from Kristen at We are THAT Family and her Works for Me Wednesday Party! 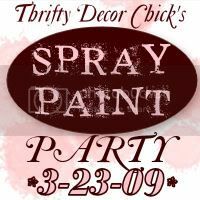 I was so excited when I read about Sarah, The Thrifty Decor Chick’s Spray Painting Party! 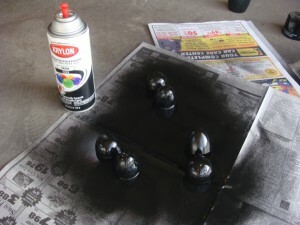 I would have bet thousands of dollars that I would be displaying something that was done by my two best friends, who are usually black spray paint and spray polyurathane. 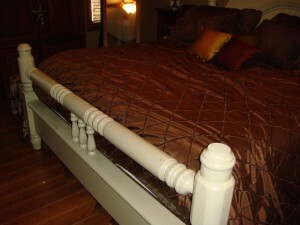 But for this project - it was my husband who headed to Home Depot to pick out a color. Let’s back up! I’m getting too excited here. 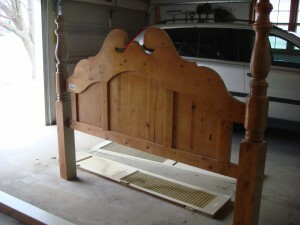 So my brother-in-law moved into town recently and he had an extra king size, oak finish, four poster bed. 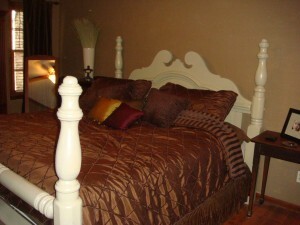 (Details to remember: oak and four poster). 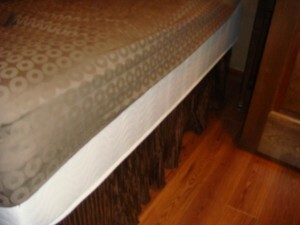 Now here is my before — and I’m really ashamed it is not better, and it is actually the back of the bed. 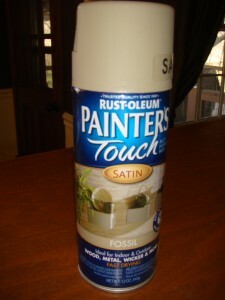 It is called “Fossil” and it is similar to ‘Favorite Tan’ by Sherwin Williams. 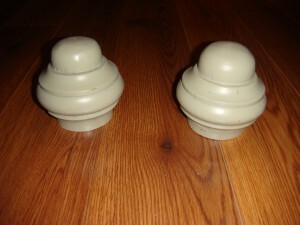 It is a tan color with some gray and green undertones. Let me just say, besides black, white and wood staining — this is the first COLOR that we have used in the house and it is just so fitting because it is also the first bed (with headboard and footboard) that we have had since we were both kids! 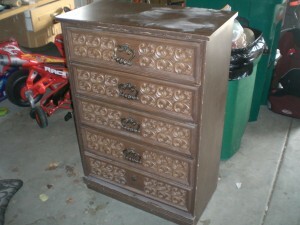 And here is the beauty, 4 cans($10.00 worth) of spray paint later! WARNING: The painting was complete and now comes the part many of you might not like. First - I do not think we are a 4 poster bed kind of couple. Second - My husband was willing to try but I stuck to my guns. (Okay you can open your eyes now). Our room really would have gotten sucked up if we could have kept them on so after we cut off just the foot boards, it was time to find something to balance the grandness of the headboard. 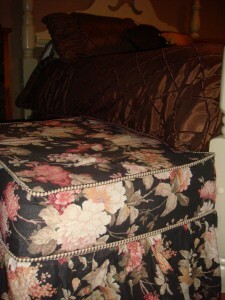 The only other change we had to make was replace the long ottoman for Lucy with a floral ottoman on wheels that didn’t block the walk way into the room. This way it can simply be rolled to the side in the morning. We just are in LOVE with the new bed. We took pictures right away and sent them to my brother-in-law and he called back to let us know he would like his bed back! 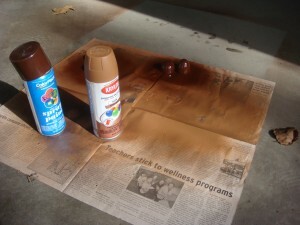 Thanks again for hosting your Spray Painting Party Sarah! 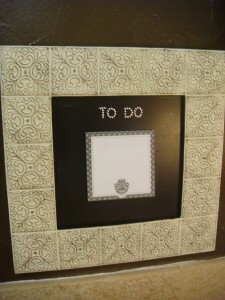 It has been a lot of fun and check out other projects at The Thrifty Decor Chick. 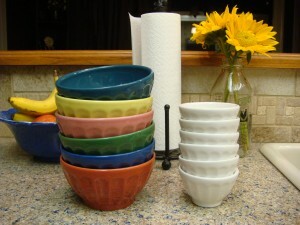 …and I wanted more latte bowls. (Oh, sorry, the purse was not in stock so she had to order it - arggh)! Isn’t it so cute?! I LOVE these latte bowls. 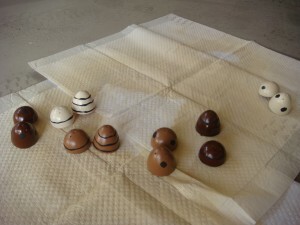 Even ask my friends who have received them as Christmas gifts from me, filled with peppermint candies. I think I have them in almost every single color! 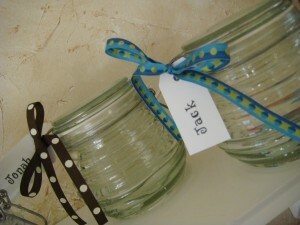 One of my favorite occasions to use them was at Thanksgiving when all the family was in town. We ate chili one night and each member had a different color. (Note: there were 4 in the dishwasher when I took the picture). And then I found the mini latte bowls. I like to use the minis for condiments, a handful of almonds, or some blueberries. They just make everything look so much more beautiful. 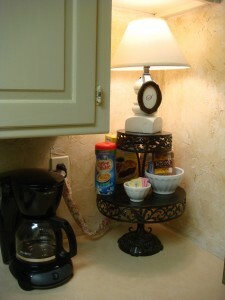 I recently used them to hold sugar packets in my little coffee corner. Have more fun with fashion in the kitchen at Fifi’s Fashionable Fridays and go knock on Julia’s door at Hooked on Houses for her Hooked on Fridays Party! Thanks ladies for hosting your parties! 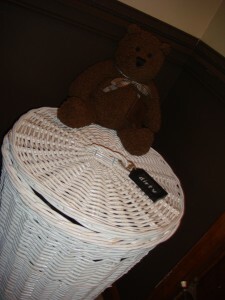 Here is one of my favorite baskets in the house! Just having sent my first newsletter out, I thought I would showcase a little of it. 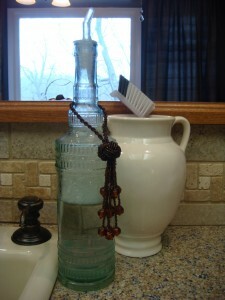 Since March is known as “The Spring Cleaning Month,” I have tried to come up with an easier way that works for me and my household to do “Spring Cleaning” and that is taking the “Spring” out of it. There is nothing worse, in my opinion, than letting something go for too long. So the answer would be to not let the cleaning get out of hand. I hear so many people say that they don’t have enough time to clean and with two young ones of my own, all I feel like I do sometimes is clean, pick up, clean, pick up, on and on. A basket (or better yet, set of baskets). I once read a great tip about putting a basket in one of your main living areas. 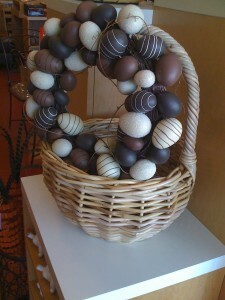 It needs to be a good size basket and I prefer one that has handles on it. Basically, once a day, you pick up your basket and go around collecting things that are not in their right spot. Maybe this could even be a task for a younger child. Each child could be the basket person for the day, or they could have their own basket (prevention method for any fights). 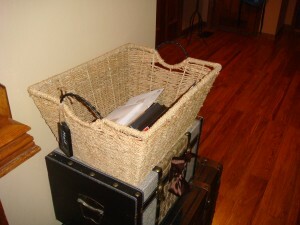 Then you take that basket with you around the house dropping things off where they need to go. Just click Our Monthly Newsletter button, enter your name and email address, and I will send you it right away! 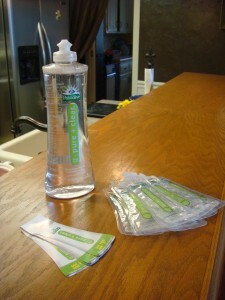 These“non-spring” cleaning tips work for me - hopefully some of them will work for you too! Head on over to We are THAT Family for another great week of Works for Me Wednesday! For this week’s Met Monday, I wanted to showcase my good friend’s mudroom makeover. Tami, Tamara or Tam (which one should I use, friend?) is the kind of person who has always brought beauty and life into anything she touches. My favorite memories of her character include the time she wore purple galoshes with her cheerleading uniform, dyed her hair orange only for people to cheer, “Go Broncos!”(we grew up in Denver) and during a time of crucial high status fashion, she bought her prom dress at the local thrift store. 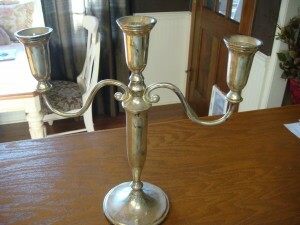 It was an antique, right Tam?! And of course she was beautiful throughout all these experiences! So recently, Tami (I’m just going to use all your names in this post) asked me to help her with some of her furniture projects for her bedroom and laundry room. But after you see this makeover - you will see too, that she really doesn’t need anyone’s help! Tam also wanted to open up her laundry room shelving and have somewhere for her and Mike to put their keys, extra change, etc. 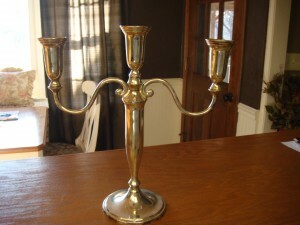 She sanded, primed, painted, antiqued it with some gold accent paint and dressed it up with some accessories from around the house. Look at the result! 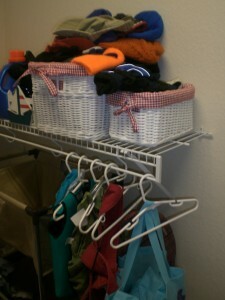 Does that not look like the prettiest laundry/mudroom you have ever seen?! 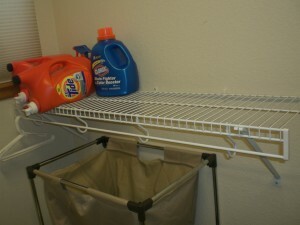 Her shelves are also nice and open and ready for some laundry! 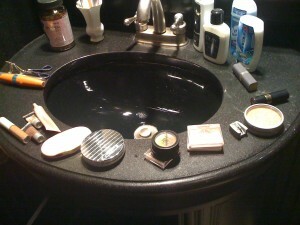 And the best part is that everything has a place, and there is a place for everything. What a great job Tamara! 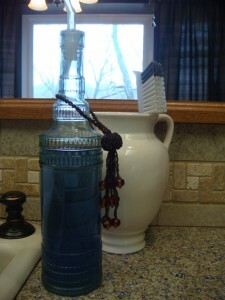 You can view Tam/Tami/Tamara’s blog too @ Mike and Me Plus 3 and soak up all the love she brings! Love you friend! News Flash! 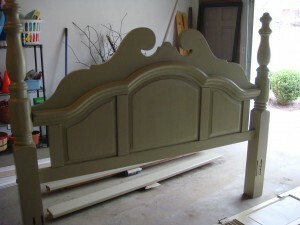 This just in…Tami just scored another great CL find for her bedroom! 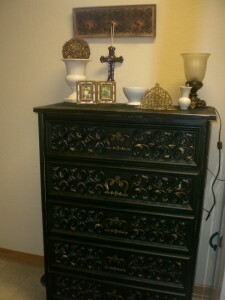 Check out the beautiful dresser she fixed up and accessorized! Check out other Makeovers at Susan’s Between Naps on the Porch! 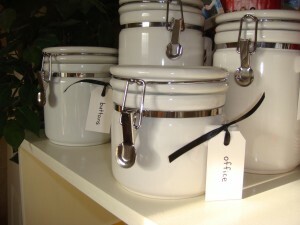 One of my new obsessions – Tags. It all started when I saw some cute and colorful tags at Target and I thought, “I have to use them in my house!” But then I remembered how boring and plain I was. So I bought white ones instead. And I guess it didn’t turn out too bad. 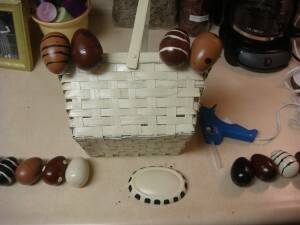 This basket is for my son’s Preschool teachers to celebrate spring. It is stuffed with a piece of tissue paper that I cut a slit into so I could fan the free drink coupons that Sonic so generously donated to us! 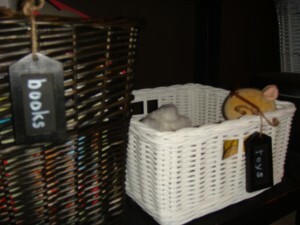 I then filled the basket with some confetti stuff, tied it with a ribbon and used the paint chips as a tag. I was thrilled to hear from many of you that, after my post, “Bzz Agent Katie at Your Service,” you have either become an agent or are looking into it. Congrats, and now let the fun begin! For more information on being an agent - visit my post or go to the Bzz Agent website. My very first newsletter is complete and going to be emailed out on the 15th of every month. The newsletter is going to be a bit different from a normal post because it will be a little longer and focus on a monthly theme and product. I will also be sharing great tips and ideas that I have been gathering from my fellow bloggers in the newsletter. If you would like to be added to the e-mailing list, just click on the “Monthly Newsletter” button on the upper right and enter your name and your email address! And Finally, A Very Sincere Thank You! I just wanted to say “thank you” to all of you that have been following me during any part of my first month of having my site up and running. Although my ultimate goal is to be working with people in their homes, organizing and decorating, I have truly been inspired by so many talented people in this blogging adventure. I feel like this experience, so far, has not only humbled and educated me, but has kept my creative juices flowing! I am continuously amazed at the overwhelmingly kind comments from caring and unselfish people out there. People who start off as complete strangers are supporting and providing such wonderful affirmation to people about their skills and life in general. I have been having so much fun posting my ideas and projects and I am excited to share many more! Join me on Friday for Julia’s Hooked on Houses Party where I confess and display my passion for Tags!